Keep your bird's mind, beak and feet active with this hanging Fiesta Ball, packed with hundreds of colorful paper crinkles! Hand-woven seagrass mesh ball serves up an endless supply of nest-building fun, or tuck your own treats and toys inside as tantalizing foraging rewards. Made with 100% safe, nontoxic materials. Metal quick link and 7" hanging chain included for convenient mounting inside the cage or out. 4.5" x 7". For parakeets to conures. Prevue Hendryx Calypso Creations Dancing Fool Bird ToyOur Prevue Hendryx Calypso Creations Bird Toy helps prevent feather picking by breaking your bird's boredom. 100% safe, non-toxic materials and colors means your bird's plucking and preening urges are being satisfied in a safe manner. This terrific bird toy provides several play options to keep birds busy with swinging, shredding, and chewing activities. Features bright colors, coconut fibers, rope, wood, woven palm leaves and more. This bird toy is ideal for small to medium sized birds. Dimensions: 14" x 5"
Designed for medium and large birds. Chime Time toys engage birds with delightful sounds and indestructible toys comprised of aluminum chimes, colorful ground calcium wafers, plastic beads and rubber rings. Each toy, in this line, attaches easily to cages with quick-links and is made of 100% safe, non-toxic materials. Ingredients: ground limestone, ground seashell, wheat flour, tapioca flour, food coloring: FDC Blue No. 1, Red No. 3 and Yellow No. 5. Guaranteed analysis: Calcium - 20.0%, Phosphorus (min) - 0.05% and Salt (min) - 0.20%. Monster-parrot toy rewards big birds with a huge hanging figure enticing head-to-toe with a mashup of chewable, climbable fun! Your bird will enjoy hours of activity and exercise exploring this amazing playground loaded with dozens of different shapes, textures, and colors. Chew the coconut head and feet, pull and preen the ropy arms, perch and climb the driftwood, even forage for surprises you've tucked inside. Safe, strong and durable enough for even the largest parrot or macaw. Dyed wood and rope are nontoxic and bird safe. Suggested for Amazons to macaws. Features: Quick link chain, coconut shell, sea grass rope, bamboo, hevea wood, mangrove wood, sisal rope, and colored wood blocks. Mega-parrot toy rewards big birds with a huge hanging ladder bursting with fluffy, preenable fun! Your bird will enjoy hours of activity and exercise exploring this amazing playground loaded with dozens of different shapes, textures, and colors. Pull and preen fluffy fibers, chew driftwood and blocks, climb bamboo tunnels, even forage for surprises you've tucked inside. Safe, strong and durable enough for even the largest parrot or macaw. Dyed wood and rope are nontoxic and bird safe. Suggested for Amazons to macaws. Features: Quick link chain, rattan, bamboo, hevea wood, mangrove wood, cotton rope, and colored wooden blocks. Mega-parrot toy rewards big birds with 3 tiers of huge bamboo ladder steps to conquer and climb! Your bird will enjoy hours of activity and exercise exploring this amazing playground loaded with dozens of different shapes, textures, and colors. Chew coconut, untie sisal knots, preen grass skirts, grasp driftwood, even explore the bamboo cylinders for hidden surprises you've tucked inside. Safe, strong and durable enough for even the largest parrot or macaw. Dyed wood and rope are nontoxic and bird safe. Suggested for Amazons to macaws. Features: Quick link chain, coconut shell, sea grass rope, bamboo, hevea wood, mangrove wood, sisal rope, cotton rope, liana wood and colored wooden blocks. Prevue pet products tropical teasers mobile bird toy 62162 satisfies natural urges and provide great beak exercise. 100-percent natural dehydrated, sterilized coconut fiber satisfies plucking, preening, nesting and foraging instincts. tropical teasers bird toys may include additional materials, such as rattan strips, feathers, shells, cotton rope and 100-percent safe, non-toxic plastic beads for beak and tongue exercise. toy connects easily to cage with quick-link attachment. toy is hand made and actual measurements may vary slightly. as always, supervise birds at play. our mobile tropical teaser toy is approximately 8-inch long and 10-inch wide, ideal for small to medium birds. Brighten up your bird's cage and encourage active play with this Prevue Pet Products Bodacious Bites Mineral Bird Toy. This exercise toy features a variety of exciting textures, colors and shapes meant to entice your bird's natural curiosity. Materials such as rubberwood branches, cotton rope, wooden beads, coconut shell and leather offer your bird a fun opportunity to exercise his or her beak. This toy is finished with 100% safe FD&C colors and features a quick-link fastener for easy hanging. Your bird won't be able to get enough of the Prevue Pet Products Bodacious Bites Tough Puff Bird Toy. Each material gives your feathered friend something different to explore, with multiple textures and bright colors to keep him or her entertained. The toy is ideal for beak exercises, and hangs easily with quick-link fasteners. Prevue Bodacious Bites Explosion features a bonanza of enticing textures to encourage natural preening behavior. Loaded with naturally intersting materials like sisal, coconut shells, straws, wood and cotton rope. Ideal for large birds. Prevue Hendryx 62805 Naturals Mangrove Bird Toy is a bird toy product from Prevue Pet Products, Inc.. This Prevue Hendryx 62805 Naturals Mangrove Bird Toy will be delivered directly to your door with fast shipping time.Naturals mangrove parrots, African Greys, and more. 5" x 14". Hang a naturally-inviting climbing kabob in your parrot's cage. Your large bird will go ape over this huge hanging gorilla toy loaded with hefty chunks of mangrove wood, bamboo perches, coconut halves, and sisal rope. Lowest rung is even wound in banana stem rope for extra textures, and the sisal knots invite adventures to be unraveled. Keep his beak busy and happy for hours! Gigantic 9" x 26" bird toy includes hanging hardware. Excellent for medium to large birds including parrots, Amazons, and macaws. 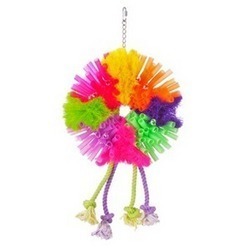 Prevue pet products calypso creations fiesta handbag bird toy is a colorful, dangling toy to shred and pull-satisfying preening instincts and discouraging plucking in your bird. made from a variety of materials, including knotted rope, crinkly paper and more. all materials are 100-percent safe, non-toxic fdandc colors and connect easily to cage with quick-link attachments. toy is hand made and actual measurements may vary slightly. as always, supervise birds at play. our calypso creations fiesta handbag bird toy is approximately 9-inch long and 6-inch wide, ideal for small to medium sized birds. Hang a naturally-inviting climbing kabob in your parrot's cage. For curious birds only, this variety includes bird favorites: coconut shell sandwiching coco fibers, bamboo ladders, and banana stem rope he won't be able to resist. Keep him busy and happy for hours! Includes hanging hardware. Excellent for medium to large birds including parrots, African Greys, and more. 5" x 14". A naturally-inviting climbing kabob in your parakeet's cage. For curious birds only, this toy features alternating rubberwood branches, coco fibers, banana stem rope, strung on cotton twine he won't be able to resist. Keep him busy and happy for hours! 8" x 2.5" bird toy includes hanging hardware. Excellent for small to medium birds including parakeets, canaries, cockatiels, and more. Double hanging bird toy provides both a ladder and a nesting hangout for curious birds. Create a fun corner hideaway made of natural coconut, rubberwood branches, and sisal to keep him busy and happy for hours! Even place your bird's favorite treats inside and reward his curiosity. Includes hanging hardware. Excellent for small to medium birds like parakeets, canaries, and more. 8" ladder with included hangar. Approx. 4.5" dia coconut with 2.5" opening. A wonderful collection of fun materials that are designed to create hours of bird bliss. Crinkly paper, interlocking plastic straws, wooden chews, rope knots, and plastic beads have all been combined together to create a colorful, delightful toy that is ideal for parakeets, cockatiels, and other small to medium sized birds. Hangs from the top of your bird's cage using a quick-link clasp. Great for shredders, pluckers and overpreeners. Toy materials include plastic knotted rope, wooden circles, plastic straws, and more. Great for medium birds. 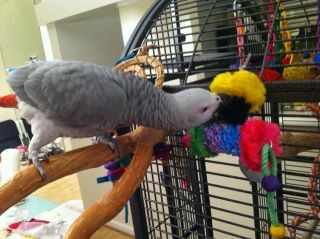 Photograph of Cookie, a Congo Grey, courtesy of Anna in California. Great for shredders, pluckers and overpreeners. Toy materials include plastic knotted rope, wooden circles, plastic straws, and more. Great for small medium birds. Festive danglilng toys to shred & pull make this toy ideal for discouraging feather plucking while satisfying preening instncts. Toy materials may include a combination of knotted rope, plastic straws, sisal, wooden beads and more. 18" x 8" x 3". Festive danglilng toys to shred & pull make this toy ideal for discouraging feather plucking while satisfying preening instncts. Toy materials may include a combination of knotted rope, plastic straws, sisal, wooden beads and more. Recommended for medium to larger birds. Great for shredders, pluckers and overpreeners. Ideal for all medium and large birds. Calypso Creations are colorful, delightful toys that will keep birds entertained and occupied for hours with their wooden circles, plastic beads, crinkly paper, plastic straws and knotted rope. All toys in this line have quick-links for easy cage attachment and are comprised of 100% safe, non-toxic materials. Cosmic Crunch Venus is made of 100% pulverized sea shells that provide caluium as they chew. It helps to keep beaks and nails manicured as they play. Most toys have glow in the dark beads with an afterglow of 20 minutes. The toys last a long time � the material is so hard that they acually �shave away� at the material instead of chew it. This toy is designed for smaller birds.